The Oklahoma National Stockyards Company recently hosted a Longhorn Opportunities Sale, which included a special fundraiser for The Children’s Center Rehabilitation Hospital in Bethany. Justin and Amanda Rombeck, owners of JBR Longhorns LLC & Bar R Cattle Company in Kansas City, Kansas, and coordinators of the Longhorn Opportunities Sale, donated Bar R Royally Spicy, female longhorn, for auction to raise money for The Children’s Center Rehabilitation Hospital. 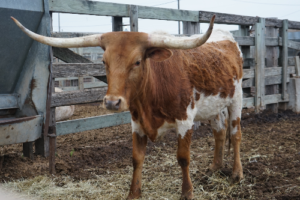 Proceeds from the donated longhorn will be used to meet a variety of patient needs, such as purchasing diapers, formula, medical and respiratory supplies and educational supplies. The Children’s Center Rehabilitation Hospital is a nonprofit organization that offers 24-hour medical care, comprehensive rehabilitative therapies, respiratory care and special education. To learn more about The Children’s Center Rehabilitation Hospital or how to donate, please visit www.miracleshappenhere.org.